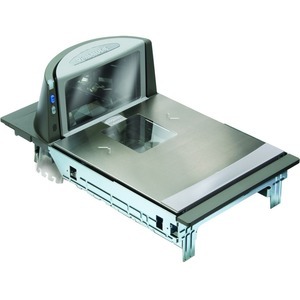 The 8400 can be configured as either scanner or scanner/scale combination with Datalogic's exclusive, patented All-Weighs® scale platter to ensure accurate produce and bulk food weighing at the checkout. Two remote scale display options are available; a single display on a pole and a dual display on a single pole for applications requiring separate displays for the cashier and customer. 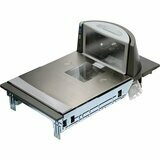 Magellan 8400 models are available in three lengths: long, medium, and short (scanner only) to accommodate various POS configurations. Flash memory allows for easy software upgrades that help extend the life of the retailer's investment. 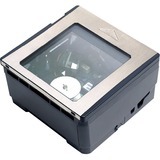 In addition, an auxiliary RS-232 port can be utilized in a variety of ways, including adding a handheld scanner, programming and configuring the scanner, or accessing the scanners label data output. For applications requiring electronic article surveillance (EAS), the 8400 can be equipped with Checkpoint EAS and can support aftermarket integrated Sensormatic EAS antennas with good read acknowledgement via the auxiliary RS-232 port.